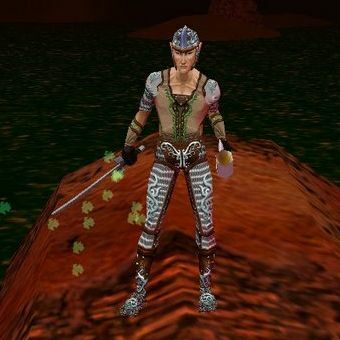 After an exploratory return to the game, we mulled last time over how “abhorrent behaviors” in Everquest became acceptable, reasonable tactics for players. As silly as they were in the game, the players were still having fun, perhaps only at the cost of detracting from the immersion in game’s fiction. Of course Everquest’s world seemed to be pretty much a lump of 20 years of the creators’ favorite Dungeons and Dragons campaigns (Racial languages? Foraging skills?) so there wasn’t a whole lot of immersion to break. Of course that was okay! They were forging new territory… While Ultima Online was the first large-scale success in the online space, with Everquest it got even more widely-accepted… and new gamers were still enamored with this persistent multiplayer combat-and-socialization model and discovering what they enjoyed doing. If people found, say, staking their virtual claim on a small collection of huts, systematically killing every orc that appeared there to be effective (that is, spawn camping) perhaps there’s something to it. These gamers didn’t want to wander around and trust that a patrolling creature might not jump them at the wrong time, but rather find an area of a reasonably predictable challenge and socialize while they waited. But in both those cases they tried to change the core behavior of those gamers, which was to seek out a location of stability where they could grind in peace. In most cases MMO’s since Everquest has tried to create alternatives, but I’m not aware of any (with the possible exception of Galaxies above) that tried to create new gameplay around it. I actually find that surprising because in many cases game developers are pretty good about taking an odd bit of unexpected gameplay and turning it into an asset. Take the practice of kiting, for instance, where a player uses a combination of damage and incapacitating powers to keep a powerful creature at a distance while they slowly whittle them down to their eventual death. In Everquest, this was seen as an abhorration that allowed players to kill things that were genuinely higher than their appropriate level. A series of nerfs ensued to try to rectify the situation, but the tactic (there’s that word again) entered the basic toolkit of the everyday MMO player. These days, kiting is less often frowned upon and considered more of a valid tactic in games like LOTRO and City of Heroes, although maligned by some. It still bears the mark of being player-driven, however… there are occasions where players accomplish feats that the designers never even dreamed of, like these WOW players that awesomely kited a devastating boss into the main human city of Stormwind. My hat’s off to you, lads. Anyway, games are full of unexpected surprises that delight gamers and even their creators. When id Software added knockback damage to rockets to Doom and Quake, they didn’t initially do so with the intent of creating the technique of rocket jumping (that is, to fire your own rocket at the ground to blast you high into the air). This only became apparently through play. However, once it happened, they didn’t shut it down. In subsequent games like Quake III they made it easier, and better balanced the risk-reward of liftoff versus damage taken. These days, Team Fortress 2 has turned these antics into practically a twisted, explosive ballet. Consider also the “errors” that gave us attack canceling in Street Fighter II (brilliantly explained in this article by God of War’s Eric Williams) that led to the lengthy combos that are integral to tourament play over 15 years after the game’s creation. The ridiculous pistol juggling seen in Devil May Cry, where a “bug” caused a damaged creature to stop falling, was embraced by its creator and set itself as the hallmark move of the game. The entire game of Deus Ex relied on emergent gameplay (whose very definition implies unforseen uses of gameplay elements) to deliver the player an experience made unique by their solutions to problems placed before them. Without these “accidents”, gaming might be a lot less interesting these days. EQ the Return Part 2: Over-Correction? As I mentioned last time, I’ve been delving back into the first Everquest after a hiatus of six years. So far I’m at Level 12 and reliving some good times in Befallen. As I said, there’s something fun and intense about the experience that I haven’t felt in the long line of succeeding MMO’s. Certainly one element about it is the sense of danger that exists. From corpse runs to trains there certainly are a lot of things that keep players on their toes. Combats were risky… a few bad misses or fizzled spells and that blue mob suddenly had the upper hand and you were fighting for your life. Players are flush with stories of how they overcame adversity, or had victory snatched from their hands at the last minute. So it’s interesting to consider for a moment the fact that all the “problems” that each successor, from Camelot to WOW, have tried to fix were indeed features that made EQ fairly dynamic and more importantly unique. Consider zone camping. Due to technology limitations that were less stringent in WOW and DAOC, Everquest was broken into zones or sub-levels that created hard boundaries that initiated a level load for the player… and of course monsters could not cross. As such, a common practice was for players to use the zone edge as a safe zone (even if they were deep in a hostile area) because they could exit the level at the first sign of trouble. This tactic came hand-in-hand with the risks of monster trains, which resulted from the fact that Everquest monsters were vindictive and followed you almost forever once you damaged them. What’s more, if they happened to pass by another idle monster, that creature would likely join in on the chase. This resulted in dungeons sometimes being the scene of ridiculous parades of hostile creatures, all chasing a single player balls-out (see inset). Once a train started, a party had almost no choice but to evacuate to the zone, which of course led all those mobs to the happy zone campers sitting to gain back their health… you can imagine the carnage that erupted. 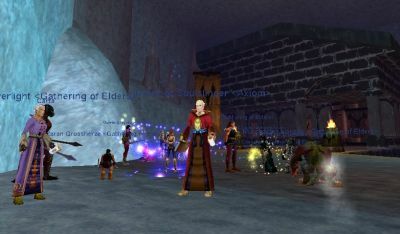 While gamers generally shouted “Hooray!” at the demise of these odd mechanics, ironically these were the same players that were carefully planning around zones and trains… In the Everquest community, it quickly evolved from capitalizing on quirks of the systems to legitimate tactics. And these tactics were just as interesting as the “mez/root/tank/heal” manuevers that had developed over EQ’s combat. They provided an additional layer of experience between “per combat” and “per session” that might be called “per expedition”. So am I saying that players were having fun and just didn’t realize it? Well, sort of. I’ve held for a long time that gamers don’t always understand what makes a game fun, and that penalties, inconveniences and grinds are often a close companion to reward (as opposed to creating a “win game” button). However, in this case, gamers were complaining more about chaos and unpredictability than against the situation itself. They just never knew when a train might come in from some other player and ruin their evening. Nothing is more frustrating than to spend an evening and not make progress (this was one of my biggest pet peeves about Everquest back in the day), and many players had successful sessions punctuated by devastatingly frustrating sessions. No doubt, they always remembered the worst ones. These gamers wanted a more predictable and efficient way of exchanging time for advancement, and they always seek out the easiest path to do so. In EQ they found areas where they could spawn camp with the easiest XP and loot. They located the areas with the biggest reward for the lowest risk. And when new games came out like Camelot and WOW where these aspects were more predictable, they rejoiced and jumped ship. They moved to experiences where each encounter was more predictable, where nothing ever went really, really wrong. They played in games where they could maintain a basic strategy and always end up on top. Ironically, what they moved towards is al almost perfect definition of a grind. Yep, we played that Everquest, thanks to a loan of some updated discs from Dave Webb. After some extensive guesswork, we managed to remember our old accounts and were pleasantly surprised to see most of our characters still hanging around. And we had 21 days of free playtime to boot (no doubt thanks to some “come back to EQ” promotion at some point). Nice. Thanks Sony! Our experience playing it was very “Everquest”. The very first moment Sandi logged on with her beloved character Celestiel, she was struck dead by a long wandering dark elf guard. We hadn’t left the game six years ago in a completely hot zone, but we had become complacent about the amount of risk that existed in that world. I remember back in the Raven days spending every Monday night playing EQ with Jersey” Jim Hughes, Rick Johnson, Matt Pinkston, Chris Foster and Jeremy Statz among others… We spent a solid six or more depressing months with this ritual, ultimately barely reaching level 20 for our efforts. We’d get home from work and start playing around 8, struggling to find each other. Sometimes somebody was on the other continent, and we had to wait the 30-40 minutes for them to take the boat over. We’d find our hunting spot and set up camp, and do great for a while… until a wandering monster or a player-led train finally got the drop on us and we perished, losing half the experience we’d gained in the previous hour. After one fairly successful evening before we finally broke it up, Jersey was heard to say “I actually had fun tonight”. We were amused, then in shock, in the realization that we were paying to play this game when 75% of the time we just walked away angry. But who was listening to us… Everquest was making Ferraris full of loot at the time, and apparently the crazy nutball addicts were happy… Incidentally, we had one of those addicts (who I won’t name) at Raven. I remember when they first released the command that tallied the total number of days played. This dude bragged that he had over a month online. I stopped for a second and pointed out “Dude! The game’s only been out for three months!” Yes, along with work (10+ hour-a-day crunch time even) and sleeping, he was still averaging over eight hours a day playing. That’s probably not that amazing nowadays that “online addiction” is starting to go mainstream, but Jesus, that was insane back then. Back to Sandi and I. Once we gt our bearings and we figured out the new HUD map that helped us navigate, we did pretty well. And we did have fun. There was something special there that has been diminished with the iterative MMO’s that we had played since, from DAOC, to WOW, to LOTRO. What was it…? Ha! 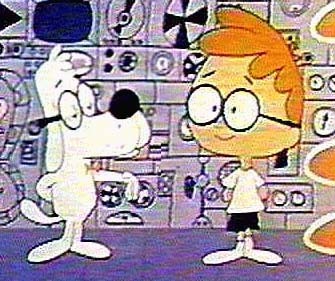 I was going to write it today, but I got too wrapped up telling my war stories, sorry! I’ll hit it up with some meat next post.